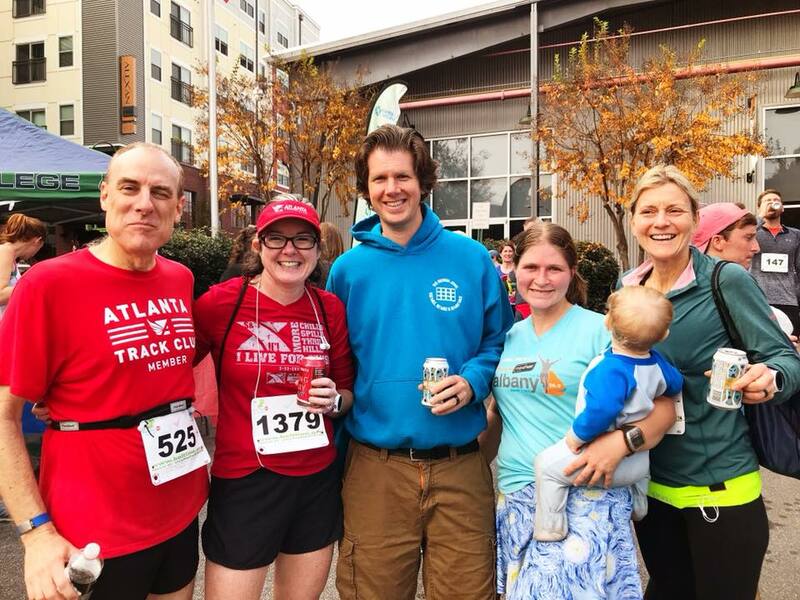 For the fifth year in a row, I ran the Eastside Beltline 10K. 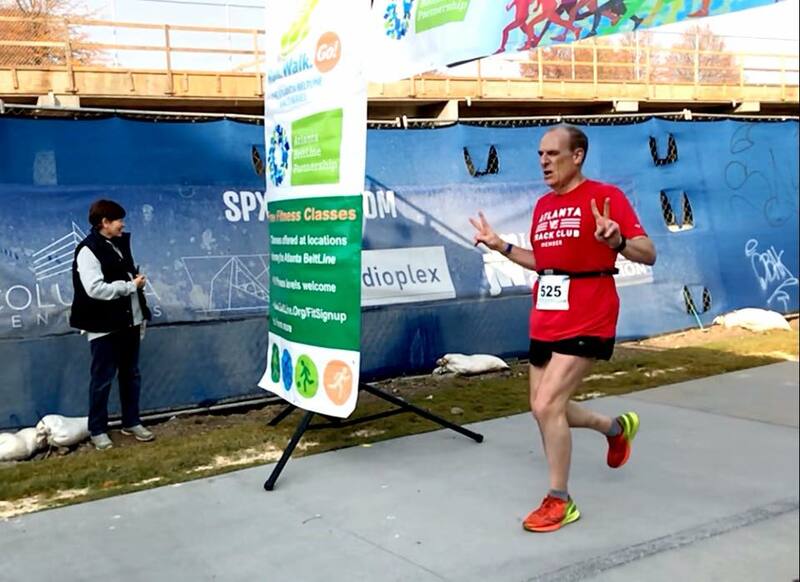 This is a deceptively tough race: the first two miles are a gentle continuous downhill, losing about 120 feet of elevation along the abandoned railway line that has been reclaimed for the Atlanta Beltline project. The third mile is on an unpaved section of the Beltline, strewn with small rocks that have not been completely removed from the railbed. At the north end of the route, we turn into Piedmont Park, for a pleasant tour of the park, with gentle rolling hills for mile 4. Then we return to the Beltline for the return trip in miles 5 and 6, struggling to regain the elevation that we so easily lost when we were fresh at the beginning of the race. 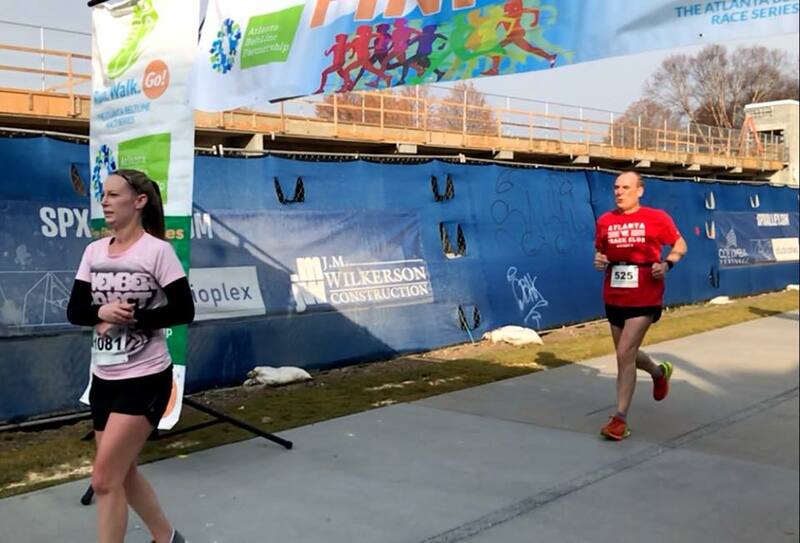 This year, the finish line was on the newly opened southern extension of the Beltline. but the overall slopes give a good sense of the challenge in this race. For today's race, I set my watch to alert me with every passing minute. On my daily commute, I've been listening to the "Rogue Running" podcast from a couple of coaches with an Austin, Texas running store. Episode #46, airing on October 23, "Race Strategy from 5K to Marathon" gave some helpful advice, albeit from the elite perspective. For the 10K race, the advice was to push to the edge of one's ability, then back off a bit, then press again. Co-host Steve Sisson described coaching a runner who set an alert for every minute, propelling him to a 32 minute finish. While a 32-minute finish wouldn't be practical for me, I thought it was worth trying to see if I could run another 50-minute finish. I resolved to aim for an 8:00 min / mile pace heading downhill, hopefully a pace that wouldn't tire me, and then use the 1 minute alert to remind myself to push on the uphill return leg. We arrived at our favorite parking place near the Beltline Skate Park around 8 am, well in advance of the 9:30 am start. My marathon training plan for this weekend was a long run of 11 miles, so I decided to warm up with 5 miles on the Beltline. After the first mile, I started to pick up the pace, practicing pushing myself a bit with every minute alert. At the risk of tiring myself, it was a good workout. I finished with about a half-hour to stretch and change into a dry shirt, appropriate for the 55 deg F temperature. As we lined up for the 9:30 am start, the starting line was a few hundred feet south of the previous years' start. As the route has seemed to be short in previous years, I was hopeful that the new starting line would ensure a true 10 kilometer, 6.22 mile distance. The organizers had also promised a staggered start, to avoid a traffic jam as we entered the narrow Beltline. The only problem was that there was no indication of what paces or expected finish times were assigned to each wave. I had lined up about 100 feet from the starting line, which ended up being at the end of the first wave. At least there wouldn't be many people behind me for the first minute or two. In fact I felt a little better about my placement after I saw running friends Steve Freedman, Sheelagh O'Malley, and Kristi Swartz, who would likely run at a similar pace to my own. Although I couldn't understand the pre-race announcements due to speaker static near my location, the first wave started shortly after 9:30 am, and I crossed the start line within about 15 seconds. I tried to stay relaxed as I got up to speed, coasting down the Beltline at 7:57 and 7:58 for the first two miles. I decided to take a short walk break after the water station at the terminus of the paved Beltline with Monroe Drive, and then resumed running along the unpaved section. Although the surface was in decent shape, as it had not rained in a couple of days, I could occasionally feel some of the rocks through my shoes. I was frustrated to slow down, but I didn't want to risk a fall or an ankle twist, finishing mile 3 in 8:29, at 24:24 elapsed. As we turned onto the asphalt walks of Piedmont Park, I tried to pick up the pace on the ideal running surface, even though I could feel the struggle on uphill sections. Here the 1-minute alerts helped me to pick up the pace for a few seconds, occasionally propelling me past a few other runners. Nonetheless I needed 8:18 for mile 4, 32:43 elapsed. As we returned to the Beltline, I decided to take a second walk break at the water station. I felt that cost me some time, but hoped that the short break would give me enough recovery to press for the rest of the race. At each minute alert I tried to speed up a bit, although my heart rate monitor was also alerting me. With all of the racket coming from my Garmin, I didn't always accelerate at the right time, or just couldn't push myself on occasion. I felt that more people were now passing me than I was passing. I needed 8:37 to finish mile 5, 41:21 elapsed. By now, I knew that I would need to run close to a 7 min / mile pace to finish within 50 minutes. I accelerated for a moment, but didn't manage to maintain that pace for long. On my workout earlier this morning, I had measured the distance from the Freedom Parkway underpass to the finish line at 0.75 mile, knowing that I would need 6 minutes to cover that distance at an 8 min / mile pace. At that point in the race, I was just past 45 minutes, so a 50 minute finish was now out of reach. Nevertheless, I did continue to push myself with each 1-minute alert. I finished mile 6 in 8:49, 50:11 elapsed, at the intersection of the Beltline with Irwin Street. Heading due straight, I could see the finish line in the distance, and continued to propel myself forward as best as I could. I didn't pass anyone in this final section. As in the last couple of years of this race, another runner fired up his rockets as he passed me at an incredibly fast pace jetting into the finish. I could see 51 minutes on the clock as I approached, then crossed the line finishing in 51:09 on my watch, also the official chip time. I was winded upon finishing, but recovered within a couple of minutes. At first I was disappointed to see that the measured distance appeared to be short (6.13 miles on my Garmin) and that my time was long (>50 minutes). However, my time and overall pace on this particular course was a little faster than last year, so that gave me some perspective that I have continued to improve in 2017. 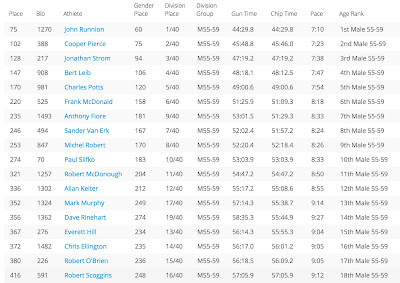 I was pleasantly surprised to learn after the race that I was 6th out of 40 in my age group, and I can't be disappointed with 220th place out of nearly 1200 finishers. That also means that in a four-wave race, starting near the back of the first wave was the right place for me to begin. 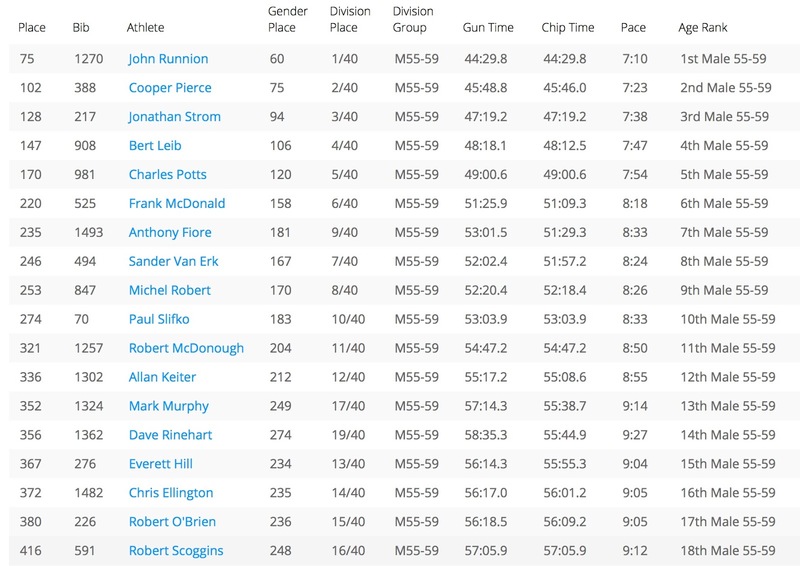 Age group results - one benefit of growing older! The 1-minute alert strategy definitely helped me to push through the tough final 2 miles of today's race: I probably would have finished 30 - 60 seconds slower without that impetus, so I will try that again in my next 10K race, which will be sometime next year. In the meantime, I'm getting ready for the Westside 10-miler next Saturday, which should be a tough hill workout, and then my goal race for December on the following weekend, the Jeff Galloway 13.1 (half marathon), where I hope to break the 2-hour mark. Bell Street burrito sample in my mouth, hence the strange lack of a smile!